Everyone has their own ways to produce photos. This is my workflow. I think of the process as being in three stages: Planning for the shoot, doing it, and post processing. Many articles on "photo workflow" tend to focus on the third and last stage - sitting in front of Photoshop. I think this is completely backwards. Once you have a great photo, getting the last bit out of it should be the easy part. I will therefore focus more on the first two steps in this series. The planning step is the step that has the most impact on the final image. When planning, everything is possible. When you reach post processing, very often nothing is possible. Getting the planning right is therefore, as you can guess, very important. The great advantage is that planning can be done completely in your head. If you realize, while planning, that you are going to need a pair of macro focusing rails, you can include them in your backpack just by making a mental note of it. When you are ten miles from civilization and much more than that from your rails, it is a lot harder. The planning doesn't have to be elaborate. A little goes a long way. What matters is photography are composition and lighting. Composition in landscape photography consists of getting yourself to the right place, as the landscape itself isn't moving - if it were, it'd be photojournalism or a disaster movie. Lighting is provided by the sun, the moon or some other non-controllable light source, which reduces the lighting part to picking the right time. 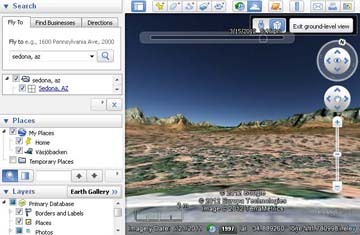 Google Earth allows you to preview both place and time; thanks to the elevation data and the time slider, you can get excellent previews of where and when the sun will rise or set, making it much easier to know roughly when you have to be on location to get the best shots, and what kind of light you can expect. If you, for example, want to know what light to expect one hour before sunset at Grand Canyon - no problem. Just move the camera to your overlook of choice and drag the time slider to the desired point in time. Google Earth is not a substitute for spending time on location scouting out the best positions. Since details such as vegetation isn't part of the dataset, it is impossible to accurately preview the view from any given point. What Google Earth tells you is a beautiful view may well be 180 degrees of massive tree trunk. What it will tell you, however, is roughly from which direction the light will come and when your chosen subject disappears into or emerges from the shadow. Good to know if you are trying to choose between a sunrise or sunset shot. 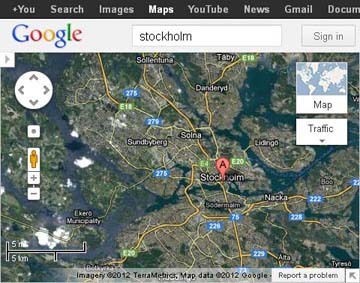 Google Maps and Google Earth are similar things packed into different interfaces. Both will show you any spot on Earth, govered in wonderful high-resolution satellite textures, but the similarity ends there. In particular, Google Maps will give you directions to the spot. Which is good if you intend to go places. I've also found Google Maps to be easier and faster to use when all I need is just a map, as opposed to a geographic visualization tool. For a quick way to check sunrise and sunset (as well as moonrise and moonset), you can go to timeanddate.com. The interface is simplistic and you don't get much more information than the time of sunrise / sunset, but for planning a hike, this is often quite enough. If your watch, cellphone or camera doesn't set its own clock from GPS-satellites or NTP servers, you can go here to get the current time straight from US Naval Observatory. It may be off by a little, due to network lag, but it is more than enough if you're setting the time manually. I always go here to set the internal clock of my Nikon D40 - I've noticed that the internal clock drifts quite a bit. Stellarium is a planetarium program, meaning that its focus is on stuff outside the atmosphere. Unlike Google Earth, you won't get a 3D view of the ground - but you'll get any information you could concievably want about astronomical objects. 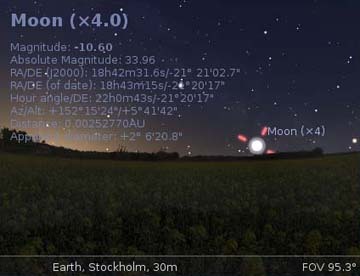 Stellarium showing the moon rise. I used Stellarium to predict the what I would get when shooting Moonrise, Granholmstoppen. Just walking around, no place in particular. I would bring my Panasonic TZ7 / ZS3[g] and a flexible tripod, like this one[h] - in case I want to do long exposures. For daytime street photography, I'd start by figuring out what kind of street photography I want to do. Different areas of a city come with different kinds of people and different kinds of action. Sometimes, just bringing up Google Maps and picking an area at random can yield surprising results. I usually bring my Nikon D40[r] and a 55-200mm VR[s] or 18-55mm VR[t] lens. Every now and then I get the idea that I should buy a Nikon 18-200mm[u] lens, but that idea usually only lasts until I see the price tag on the 18-200. Like daytime street photography, I start by figuring out where I want to go. Then I pack a Nikon D40 and an 18-55mm VR lens. The 55-200 stays home, as I'm not able to get sharp shots with any kind of reliability, even with VR. For general daytime photography, I either bring all lenses I have: 10-20mm Sigma, 18-55 Nikon and 55-200 Nikon. If one is left out, it is usually the 18-55 that stays home. The 18-55 is very good for close-up shots, but unless I know I'll be doing a lot of nature photography, it's not worth the effort to carry it. With "nighttime" photography I mean photography where I use a tripod at night. Like before, I start by figuring out what I want to achieve. One nice thing with cities at night is that you can do long exposures of streets and get some nice light trails. Looking for some major roads or intersections on a map is a good start. If you're more interested in capturing skylines and panoramas, Google Earth can help find a viewpoint. If you want to catch the blue or golden hour, I recommend using timeanddate.com[v] to figure out sunset and sunrise times. I usually bring the "full kit" along for this - if I'm going to haul the tripod along, then I might as well throw in two more lenses and get some more creative options. Into and onto my Kata 3N1-20[w] backpack goes: Nikon D40, Sigma 10-20mm[x], Nikon 18-55mm and 55-200mm, and a tripod. Like nighttime photography, I start off with a map and Google Earth. What is an interesting place varies from person to person, but interesting places for me are hills, lakes and streams. Sometimes I set out with the goal of just getting to one spot and photographing whatever I find there. If I intend to do macro photography, I bring a Raynox DCR-250. If I think I'll need them, I also bring a set of macro focusing rails. Most of the time, though, setting the camera to continuous drive so it keeps shooting as long as I hold the shutter button down, and then hand-holding it with the DCR-250 on while taking 20-30 shots on auto, will result in at least one good shot. With the exception of astrophotography, where the subject is quite give, nighttime nature photography is the hardest. Even with a full moon, it requires very long exposure times; and quite frankly, I just can't find that many interesting things to photograph. I usually end up using a wide-angle lens like the Sigma 10-20mm on a tripod - and I rarely extend the legs of the tripod all the way, just for added stability. If you have a sturdier tripod than mine, this probably doesn't apply to you. Although I must add that Nikon's 10mm f/2.8[m], Panasonic's 14-42mm f/3.5-5.6[n] and 14mm f/2.5[o], Samsung's 30mm f/2[p], and Sony's 16mm f/2.8[q] pancake lenses are very interesting.